The Norman Blake Memorial Lecture 2015. Norman Francis Blake (1934-2012) was a historian of medieval literature and language, a scholar whose work ‘can scarcely be matched in its scope’ (as A.S.G. Edwards wrote in an obituary). Appointed Chair of English Language at the University of Sheffield in 1973, Blake was subsequently director of the Humanities Research Institute here (among many other roles). It is therefore fitting that the lecture given in his honour brings together the linguistic and literary materials of the early modern period with which Blake was so much concerned and the tools of the digital era, an area of scholarship with which the HRI is much concerned. 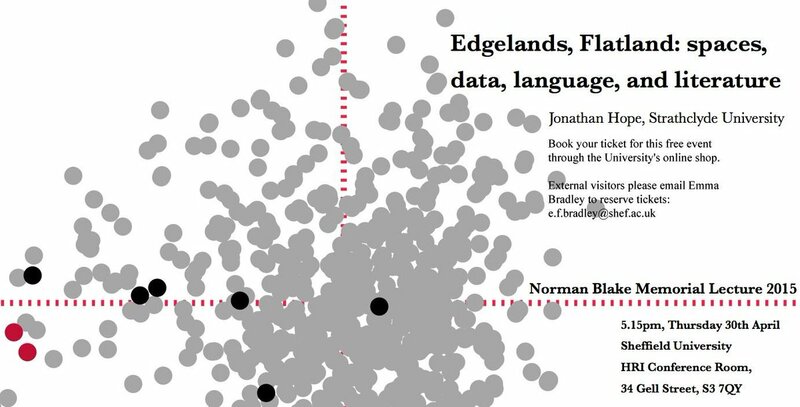 In the second (biennial) Norman Blake memorial lecture, Professor Jonathan Hope (Strathclyde) will be talking about tools such as EEBO-TCP and how they revolutionise our ability to study the history of English language and literature by projecting data (texts) into new, mathematical, spaces. Hope’s expertise lies in literary linguistics and digital techniques for analysing texts. He’ll begin with the Sheffield poet Matthew Clegg (Edgelands), and E.A. Abbott (who, like Norman Blake, produced a grammar of Shakespeare). Examples will also come from Shakespeare and Early Modern drama, and the promise is of a stimulating discussion with cross-disciplinary appeal. Norman Blake was born in Brazil, but attended boarding school in England and later went on to study at Oxford under tutors that included C. S. Lewis and J. A. W. Bennett. As a young academic he quickly found respect for his scholarly work on Old Norse and medieval English prose and style. In 1969 he published Caxton and His World, about England’s first printer; he would eventually more than 40 essays, books and editions dealing with Caxton’s work. After periods of tenure at the universities of Liverpool and Toronto, Blake was appointed Chair of English Language at the University of Sheffield in 1973. He continued to publish widely on the history of the English language, his books including The English Language in Medieval Literature (1977) and The Cambridge History of the English Language, 1066-1476 (1992). During his time at Sheffield, Blake’s research interests gradually extended further to encompass later periods of literature. He became deeply engaged in the study of Shakespeare’s language and style, producing publications including The Language of Shakespeare (1989), A Grammar of Shakespeare’s Language (2002) and Shakespeare’s Non-Standard English: A Dictionary of his Informal Language (2004). Blake suffered a stroke in 2004 from which he never fully recovered; he died in Sheffield in 2012. Read a full obituary. To honour Prof. Blake’s scholarship, in 2013, the School of English founded a bienniel lecture. The 2015 Norman Blake lecture will take place at 5.15pm on Thursday 30th April in the HRI Conference Room, Gell Street. This event is free and open to all. It is possible to reserve a seat in advance by email or through the University’s online shop.